Easy to order and use combination packs including rolls of Scotch Box Sealing Tape and convenient handheld dispenser. 3M Scotch bonus pack with box sealing tape and H122 tape dispenser comes with everything you need to package and ship boxes. 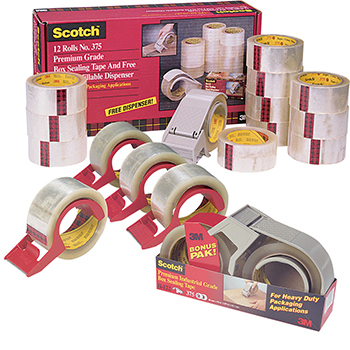 The Easy to order Bonus Packs of 3M PSD Scotch Box Sealing Tapes combination packs include rolls of 3M 375 Scotch carton sealing tape that are easy to seal around cartons, box edges, and over rough surfaces for a tight seal. Also included in the Scotch carton sealing tape combo pack is a lightweight, strong, compact handheld tape dispenser with built-in brake for tighter, more precise seals. The 3M 375 tape is 3.1 mil thickness which features a hot melt rubber resin adhesive.